Earlier this week, I did what I do and used my voice here to gather my wits, organize my thoughts, and purge some very strong emotions. 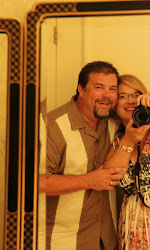 Perhaps you read those musings, my blog on our mistreatment by Southwest Airlines. Many of you were kind enough to share on Facebook and Twitter and help spread the word that the behavior was wholly unacceptable. 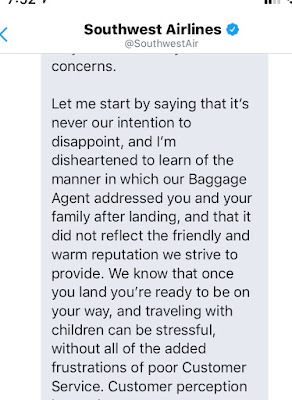 One tweet, garnered a response from Southwest. Just one. The responder urged me to send a direct message via Twitter outlining the incident. I did so in great detail. It is never our intention to disappoint? What? Well, of course not. It is never anyone's intention to disappoint -- is it? 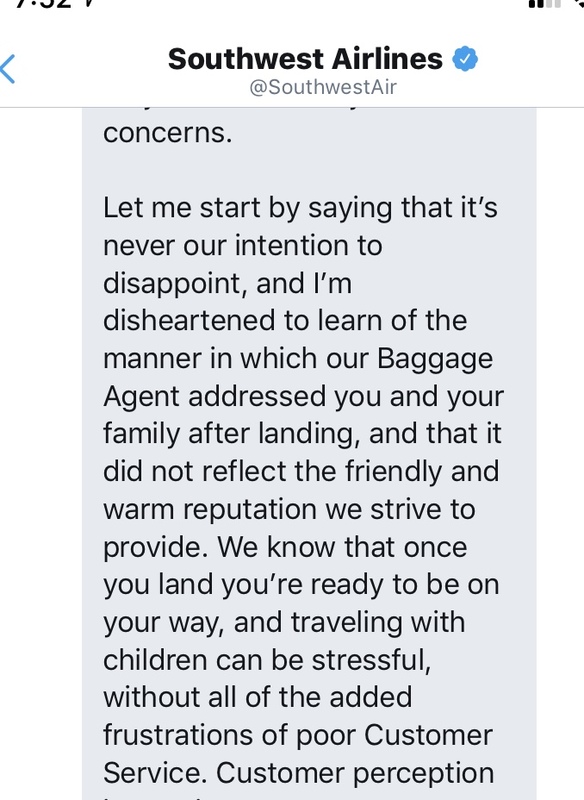 But when I reached the part where she told me that "We know that once you land you're ready to be on your way, and traveling with children can be stressful...." I knew she had not even taken the time to read my message to her -- much less the blog post. I waited a few hours. My emotions need to subside a bit first. Then I explained that it was evident she hadn't read our story and had no idea what had happened. I explained it again. I attached a photo of Benjamin forcefully-reclined in his chair. I gave her their ages for pete's sake. I wasn't traveling with CHILDREN and I wasn't just eager to be on my way. The Southwest team did a poor poor job Monday night in New Orleans. Period. Not one piece of this was on me or my expectations. And yet, I still ended my message to her by offering to help make it better myself. I told her that Special Needs Moms are a fabulously informed group and that I could put together a team who could help with training, work together with the airline to teach their team how to handle/help families like our's. The next response was warmer -- and from a different team member. Clearly, Alice is their go-to response writer when they need more feelings. I appreciated her "heart-felt" apologies. They also sent a $250 voucher. So one of us can almost take a trip now. Super. I keep waiting for my phone to ring. I have carried it around all week, hoping for a call. And listen, I am not hoping for the call because I want to add airline consultant to my resume. I am hoping for the call because I desperately need to believe that someone cares. I desperately need to believe that someone in the "Senior Leadership" hears the saga of our Monday night in New Orleans, and thinks "Oh my gosh, we HAVE to do better." In the meantime, I am on a mission to do what I can to improve travel for our families. My heart breaks when I hear from other mothers that they simply DO NOT travel because of fear that their child's wheelchair will be damaged/destroyed. It is just too hard. I hear you, Moms. I get it. I feel that sometimes too -- I know the chair is safe if I am driving it myself in our van. I know that Benjamin is secure on our travels when he is IN his chair, with the supports his body requires. 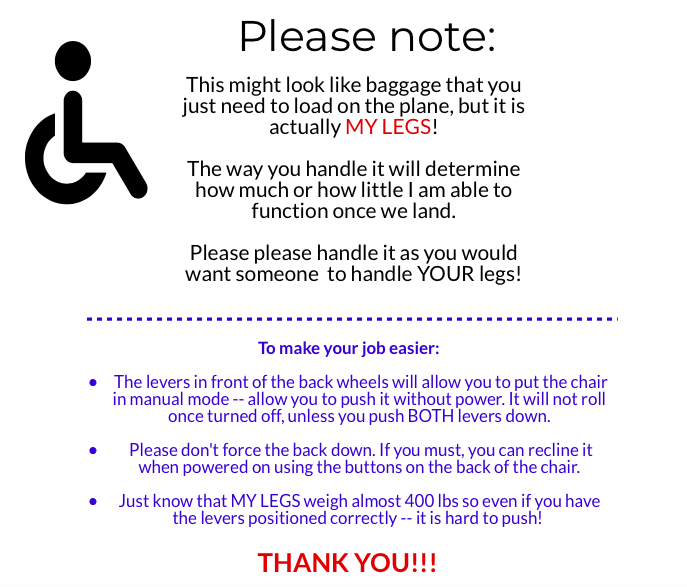 Flying means that we remove his legs and put him in an unstable environment (the plane seats) and furthermore, if we want to save wear and tear on the chair, then we do what we did in Dallas and allow them to simply move the chair from one cargo to the next meaning Benjamin spent the layover in one of the airport wheelchairs completely unsupported!! Me to Wheelchair attendant at Dallas Love Field: "Does that have a seat belt at least?" Attendant: "No Ma'am!! But don't worry he won't need one!" Um, yes he will. Benjamin -- and all the bazillion amazing people like Benjamin -- can NOT hold themselves safely in any chair much less a MOVING chair with no seatbelt!!!!!! I don't care how good a "driver" dear attendant thought he was. That had nothing to do with it. We plan to print this on card stock and laminate it. We'll punch a hole and hang it on the wheelchair the next time we travel. We already remove the headrest (to shorten the chair), the seat cushion (it is inflatable so we don't want it accidentally punctured); the arm that holds his iPad. On his last chair, I could easily unplug the joystick and we would carry that on the plane. 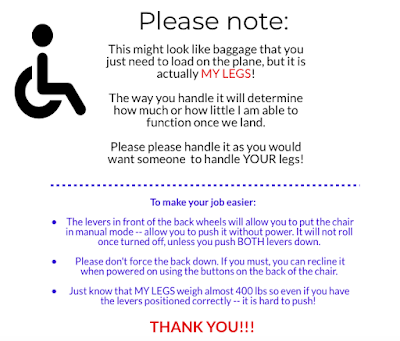 But this chair is SO heavy (400 lbs) that it is almost impossible to push in manual mode (Please ask me, I am all too aware of that after Monday night!) that we leave the joystick on in case they prefer driving it with power. Can you see us loading the plane carrying all of this? Perhaps you have. Hear me. We are willing to do our part. We are not asking for a one-sided system. What else can we do to make traveling possible for our family and for all the families like ours? I am listening?? I am ready to spread the word!